A true classic, this sleigh bed adds traditional appeal to any bedroom space. 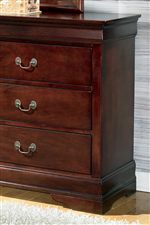 Constructed of select veneers and hardwood solids in a warm dark brown finish, it has a sleigh curved headboard and footboard for timeless sophistication in child's bedroom from their early childhood to their teenage years. 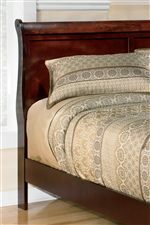 The Alisdair Twin Sleigh Bed by Signature Design by Ashley at Household Furniture in the El Paso & Horizon City, TX area. Product availability may vary. Contact us for the most current availability on this product. The Alisdair collection is a great option if you are looking for Transitional furniture in the El Paso & Horizon City, TX area. Browse other items in the Alisdair collection from Household Furniture in the El Paso & Horizon City, TX area.